As we journey through Lent, may we continue to hold in a special way our Muslim sisters and brothers in New Zealand and around the world. May this be an intentional time to build friendship and understanding that leads to mutual healing, unity, and peace. We thank the General Council for sharing their message of solidarity with the Church and the Muslim community of NZ which was sent on March 16. This message comes to you from the Georgetown University as Peter Hughes (Peru), the CCAO team and I attend the pre-Synod on the Amazon conference. One important action step that is emerging from this conference, impulsed by the call to territorialise the Amazon Synod process around the world, is the formation of an Asia-Pacific-Oceania Working Group as well as other regional working groups in Mesoamerica, Europe and North America. This will be important spaces for us and I hope we can bring our Columban voice to these groups through your participation. We will follow up on this in more detail in the weeks ahead. 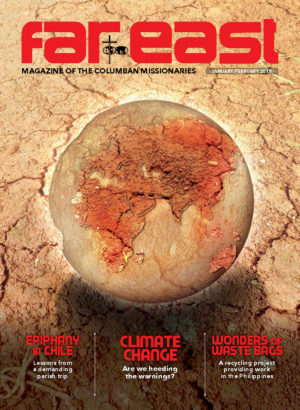 I also share with you a link to a story in National Catholic Reporter that speaks of the recent Divestment conference in Washington, DC that was cosponsored by Columbans and GCCM. A word of thanks to Scott, Becca, and Wesley for their engagement in this conference. I was among the speakers sharing our Columban divestment story. 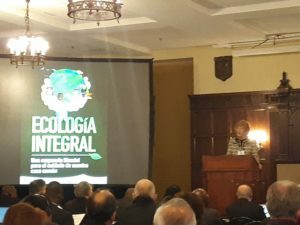 Today we opened the last day of the conference with a reflection by Mary Evelyn Tucker, co-founder and director of the Forum on Religion and Ecology at Yale University. 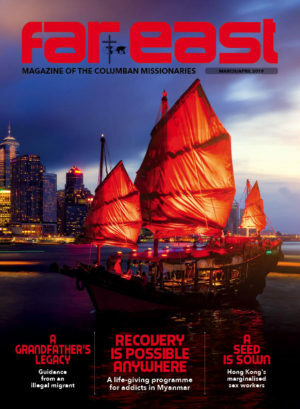 Without false sentimentality, Mary Evelyn spoke of a new hope that is blowing through the Church and world that is coming from the voices of indigenous peoples, of the earth and youth. She spoke of a deep and shared longing, a yearning, and a new opening in the Church to humbly listen and learn from other cultures, other faiths, and the universe. Mary Evelyn invited us to dip in to this longing as a way to find a new way to be in relationship that honours our ancestors, both human and non-human, as well as future generations of all life. Discovering a doctrine of discovery in the Church is at the heart of conversion that will bring us in to contact of the Logos that dwells within all people and creation. The remainder of day is dedicated to listening from the geographic working groups that imagined how the Synod on the Amazon can be territorialised throughout the world. Cardinal Luis Antonio Tagle spoke this morning on Spiritual Ecology: LS, an approach to Universal and Interreligious Communion. I am shocked and appalled at yesterday’s terrorist attacks at two mosques in Christchurch, where 49 worshippers performing Friday prayers were callously murdered, many more injured, and the survivors, respondents, and indeed the entire nation and peoples around the world were traumatised. I stand in solidarity with you in your horror, grief and distress. I offer my prayers for the victims and extend my condolences to their families. I send my thoughts and my prayers to the injured and to all the individuals and communities who have been affected by this senseless violence.